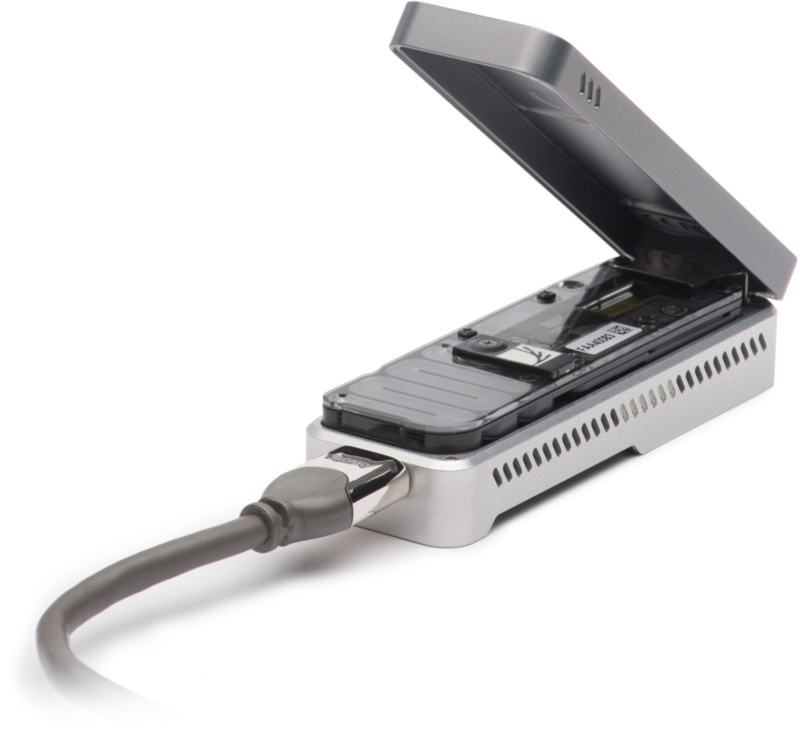 Long nanopore reads enhance structural variant resolution. Cacace et al. performed whole genome sequencing to investigate an unresolved autosomal dominant dementia family; long reads obtained from PromethION sequencing validated the presence of a structural variant disrupting the coding sequence of the gene DPP6. Subsequent follow-up investigations provided evidence for the role DPP6 loss of function in dementia. Emerging evidence suggested a converging mechanism in neurodegenerative brain diseases (NBD) involving early neuronal network dysfunctions and alterations in the homeostasis of neuronal firing as culprits of neurodegeneration. In this study, we used paired-end short-read and direct long-read whole genome sequencing to investigate an unresolved autosomal dominant dementia family significantly linked to 7q36. We identified and validated a chromosomal inversion of ca. 4 Mb, segregating on the disease haplotype and disrupting the coding sequence of dipeptidyl-peptidase 6 gene (DPP6). DPP6 resequencing identified significantly more rare variants - nonsense, frameshift, and missense - in early-onset Alzheimer’s disease (EOAD, p value = 0.03, OR = 2.21 95% CI 1.05–4.82) and frontotemporal dementia (FTD, p = 0.006, OR = 2.59, 95% CI 1.28–5.49) patient cohorts. DPP6 is a type II transmembrane protein with a highly structured extracellular domain and is mainly expressed in brain, where it binds to the potassium channel Kv4.2 enhancing its expression, regulating its gating properties and controlling the dendritic excitability of hippocampal neurons. Using in vitro modeling, we showed that the missense variants found in patients destabilize DPP6 and reduce its membrane expression (p < 0.001 and p < 0.0001) leading to a loss of protein. Reduced DPP6 and/or Kv4.2 expression was also detected in brain tissue of missense variant carriers. Loss of DPP6 is known to cause neuronal hyperexcitability and behavioral alterations in Dpp6-KO mice. Taken together, the results of our genomic, genetic, expression and modeling analyses, provided direct evidence supporting the involvement of DPP6 loss in dementia. We propose that loss of function variants have a higher penetrance and disease impact, whereas the missense variants have a variable risk contribution to disease that can vary from high to low penetrance. Our findings of DPP6, as novel gene in dementia, strengthen the involvement of neuronal hyperexcitability and alteration in the homeostasis of neuronal firing as a disease mechanism to further investigate. Rita Cacace, Bavo Heeman, Sara Van Mossevelde, Arne De Roeck, Julie Hoogmartens, Peter De Rijk, Helena Gossye, Kristof De Vos, Wouter De Coster, Mojca Strazisar, Greet De Baets, Joost Schymkowitz, Frederic Rousseau, Nathalie Geerts, Tim De Pooter, Karin Peeters, Anne Sieben, Jean-Jacques Martin, Sebastiaan Engelborghs, Eric Salmon, Patrick Santens, Rik Vandenberghe, Patrick Cras, Peter P. De Deyn, John C. van Swieten, Cornelia M. van Duijn, Julie van der Zee, Kristel Sleegers, Christine Van Broeckhoven, the BELNEU Consortium.